LiveHelpNow operator panel loads slowly, shows "Page not found" errors or freezes. My operator panel loads slowly, sometimes shows "Page not found" errors, or even freezes or shows unordered/messy information. The LiveHelpNow operator panel may be loading slowly because of internet connectivity issues, firewall settings on your network, or restrictions within the Internet Explorer browser. 1. Download the latest version of the LiveHelpNow Alerter: http://www.livehelpnow.net/alerter. Run the 'LiveHelpNow' program. 2. Click on View > Reload in the menu as shown below. 3. 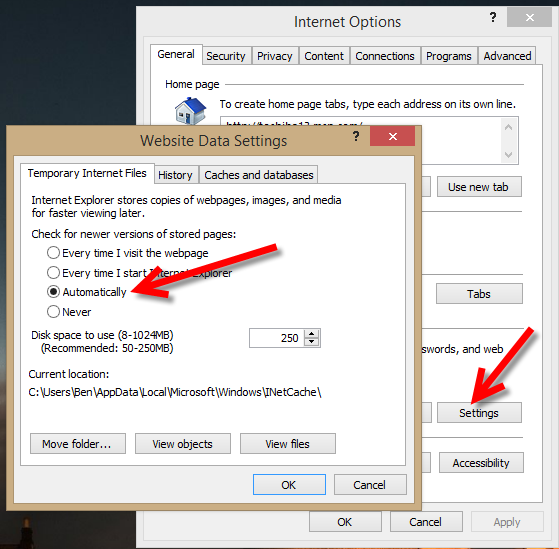 Open your Internet Explorer web browser, go to Internet Options -> General tab and click on 'Settings'. Make sure 'Automatically' is selected as shown below. 4. Finally in Internet Explorer -> Internet Options and switch to Security tab ->Trusted sites and add *.livehelpnow.net to Trusted sites list. Uncheck "require https:" first if you are unable to add *.livehelpnow.net to Trusted sites list, then add it.